The Center for University-Based Development wants to provide improvements to the aesthetics of West Jackson by transforming boring infrastructural elements into artistically designed outdoor public art that enhances and celebrates the local environment. The project will involve painting two-dimensional renderings on up to 20 signal utility boxes at a fee of up to $500.00 per utility box. Preference will be given to designs that emphasize color and form, use the illusion of three-dimensional space, are aesthetically pleasing and relate well to the site(s) in which they are implemented. Materials, colors and visual content are subject to the approval of both the Signal Box Art Project Selection Committee and the City of Jackson. Designs depicting religious, political, or controversial subjects will not be considered. Please click on the Link below for full application. 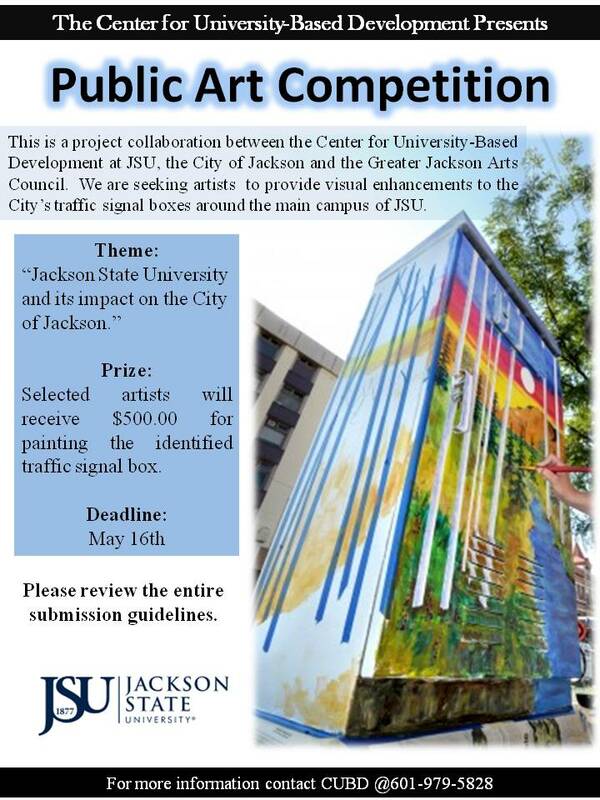 RSAA artists vow for the $500 prize money in the Center For University Based Development @JSU, in conjunction with the City of Jackson and the Greater Jackson Arts Council, Art Contest that Highlights Images of how JSU enhances the quality of living in Jackson, Mississippi,depicted on 20 metal traffic boxes surrounding the main campus!